Ricoh MP C307SPF Driver Download. The Ricoh MP C307SPF is a compact A4 laser multifunctional systems. The Japanese manufacturer Ricoh is launching two devices in the 30-page class with the MP C307SP and MP C307SPF color laser multifunctional systems. The trend in the printing market is multifunctional color printing systems in the A4 segment. This is also borne by Ricoh and introduces the MP C307SP and MP C307SPF two devices in this category. In contrast to the MP C307SP, the MP C307SPF offers a fax function. With the MP C307SPF, Ricoh is launching a new color laser multifunction device in the A4 segment. The systems print at a speed of 30 pages per minute. With the black toner cartridge the new Ricoh-Multis come 17,000 pages wide. The color cartridges are designed for 6,000 pages. The recommended page volume is 2,000 to 5,000 pages per month. Using the ADF, documents can be scanned on both sides. The usual scanning and copying functions can be controlled by a 10.1 inch color panel. In addition, they can also be controlled via mobile devices such as smartphones or tablets. For example, documents from the SmartDevice can be sent to the MFPs for printing. It is also possible to scan documents via the MFPs and send them directly to a mobile terminal. 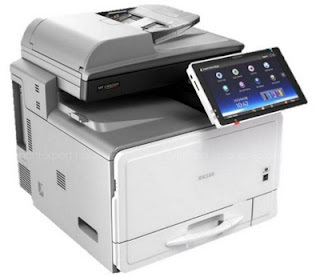 According to Ricoh, the necessary connection between SmartDevice and MFP can be established without prior registration or network connection. For energy consumption Ricoh provides the TEC values ​​1.089 kWh / week for the MP C307SP as well as 1.092 kWh / week for the MP C307SPF. The C307 series offers an SD slot, a USB2.0 host, interfaces for mobile printing (wireless LAN (IEEE 802.11b / g / n), Bluetooth, NFC tag) as well as Ethernet 10 Base T / 100 Base-TX / 1000 Base-T. According to the manufacturer, the MP C307SP costs 3,025 euros. The Ricoh MP C307SPF with fax function is listed with 3,150 euros. Increase productivity and achieve a fast and sustainable return on investment with the new Ricoh A4 color multifunction. Ricoh MP C307SPF is designed for fast operation and easy integration with your document flows, this new generation of multifunction devices is distinguished by its large intuitive touchscreen as easy and user-friendly as a tablet. It is also distinguished by the ability to manage all document flows and functionalities of a large A3 multifunction model. But these Ricoh MFPs offer more than increased productivity. No need to invest in additional space to accommodate the necessary features. Compact and discreet, they settle everywhere without disrupting your employees or your meetings. To reduce your costs by reducing your carbon footprint, Ricoh has also made them co-energetic.